Universal Lighting Technologies™ has announced the latest in high efficiency wireless controllable lighting systems with the release of the DEMANDflex™ ballast family and DCL® (Demand Control Lighting) controls. DEMANDflex ballasts feature an innovative wireless control technology to receive commands without the need for extra control wires. These ballasts have the flexibility to have power levels tuned during installation at the circuit level to optimize and maximize energy savings. Together, DEMANDflex ballasts and DCL controls represent the most cost-effective lighting system available today. DCL controls allow for local control with energy management systems and external control via the Internet with networked managed systems, as well as integration with utility demand response programs. DCL lighting controls can reduce power levels as needed by as much as 50 percent, providing significant demand level and usage reductions. Because there are no ballast control wires, DEMANDflex ballasts are ideal for both retrofit and new construction applications. DEMANDflex ballasts can be initially installed and tuned to specific power and light levels during a lighting retrofit with DCL control capabilities added at a later date. The initial DEMANDflex ballast offering includes a 2-lamp F54T5HO ballast and 2-, 3-, and 4-lamp ballasts for F32T8 lamps. 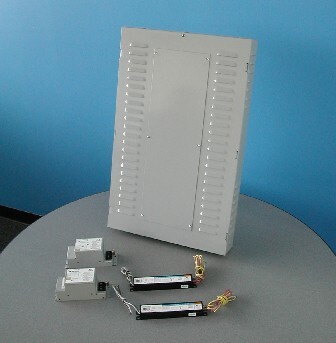 All DEMANDflex ballasts incorporate program start technology, which makes them ideal for use with occupancy sensors, THD<10%, and universal input voltage. DEMANDflex ballasts also meet or exceed the appropriate CEE high efficiency requirements, making them eligible for various rebate programs.